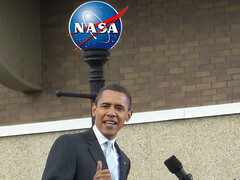 President Obama gave a speech at NASA’s Kennedy Space Center today to outline his new, revamped space policy. You may remember that his last revamping caused quite a stir, with people screaming that it would doom NASA. I disagree. Canceling Constellation still strikes me as the right thing to do, because it was becoming an albatross around NASA’s neck. Mind you, this was also the recommendation of the blue ribbon Augustine panel. You may also note that NASA astronauts are split over all this, with Buzz Aldrin, for example, supporting Obama, and Neil Armstrong and many others disagreeing. It’s a mess, and hard to disentangle what everyone’s saying. There’s been a huge amount of misinformation about it (with — shocking — Fox news leading the way; they spout so much disingenuousness, nonsense, self-contradiction, and outright stupidity that it makes me want to fly to their studios just to slap them). But Obama’s plan seems pretty clear. 1) As before, NASA’s budget will be increased in the new plan. Let me repeat that: NASA’s overall budget will go up. And not just a little; we’re talking $6 billion over the next five years. A lot of that goes into scientific research. So far from it being doom and gloom, that’s good news. 2) A new heavy-lift rocket will be developed. Let me repeat that as well: funding is provided for NASA to create a new heavy-lift vehicle. So yes, Constellation will be canceled, but a new system will be developed that (hopefully) will be within budget and time constraints. 3) The Orion capsule, based on Apollo capsule legacy, will still be built. Initially it will be for space station operations as an escape module, but can be adapted later for crewed space missions. 4) He wants NASA to plan manned missions to near-Earth asteroids in the 2020s, and to Mars in 2030s, but no return to the Moon. OK, so what do I think of all this? 1) The increase in NASA’s budget is most welcome. Some of this goes to climate change studies (which the denialists will rant and scream about, but too bad). Some goes to science, some to education. All in all, given NASA’s minuscule budget, any increase rocks. And a lot of this goes into space science. 2) This new rocket proposal makes me very happy. As I have stated repeatedly, NASA keeps going from one project to another without a clear goal or a streamlined system of attaining it. The Shuttle, as amazing as it is, was a terrible project once it was realized — hugely over budget, hobbled massively from what it should have been able to do, and unable to provide cheap and easy access to space with a fast turnaround. Ditto for the Space Station; it became a political pork barrel project and instead of a sleek engineering wonder it became another bloated project with no clear goal. Some people are complaining that we’ve already sunk $10 billion into Constellation, and we shouldn’t throw that money away. I think that’s a red herring. If Constellation was a waste of money, then we need to staunch that flow. I’m not saying it was, but I’m pointing out that you need to show me that the system was not a waste of money first before complaining that we can’t cancel it after spending that much. The President quite reasonably concluded that spending $50 billion to develop a vehicle that would cost 50% more to operate, but carry 50% less payload was perhaps not the best possible use of funds. To quote a member of the Augustine Commission, which was convened by the President to analyze Ares/Orion, "If Santa Claus brought us the system tomorrow, fully developed, and the budget didn’t change, our next action would have to be to cancel it," because we can’t afford the annual operating costs. Mind you as well that this money already spent won’t be wasted. It’s not like we have a lot of rockets sitting around gathering dust. That money was spent on developing technology, knowledge, and experience that will go into any new system created. I’ll note that the cancellation of Constellation means a loss of many jobs. This new plan should restore a lot of them. I’d be interested in seeing a balance sheet for that. Another complaint with little or no merit (coming from a lot of folks, including the insipid talking heads on that Fox link above) is that once the Shuttle is over, we need to borrow a lift from the Russians to get to space. As much as I’d like to see us with our own, independent, and healthy space program, I don’t see riding with the Russians as entirely a bad thing. It’s cheaper than the Shuttle, by a large amount. The bad political decisions involving NASA for the past forty years have put us in this predicament, not anything Obama has done over the past 15 months. And I’ll remind you that this predicament really started rolling when the Bush Administration and NASA decided to stop the Shuttle program with no replacement possible for at least four to five years after the last Shuttle flight. Even if Obama had done nothing; we’d still need the Russians’ help to get into space. And it’s only temporary. Under Obama’s plan we’ll have a new rocket system around the same time Constellation would’ve gotten going anyway. As far as relying on private space, I have been clear about that: NASA should not be doing the routine, like going to low Earth orbit. Let private companies do that now that the technology has become attainable by them. NASA needs to innovate. And I’ll note that NASA has relied on private space venture — Boeing, Lockheed, and many others — for decades. This is hardly new. 3) As an adjunct to everything I just wrote above, the Orion legacy capsule project will continue, underscoring my point. We’re taking the knowledge gained over the past few years and applying it to new technology. I rather like Orion, and I’m glad it’s not going away. 4) Well, here’s where I think the new policy falls short. I strongly support missions to near-Earth asteroids. These rocks are areal threat to life on Earth, and the more we know about them the better. Getting to them via rocket is actually easier in many ways than getting to the Moon, so these kinds of missions are cost-effective, and we can learn vast amounts from them. And we would also gain critical experience in visiting asteroids that could come in handy if one has our name on it. I’m not as gung-ho on getting to Mars because I think the engineering and knowledge needed to put humans on such a long trip is not where it needs to be yet. So how do we get that knowledge? By going back to the Moon. Obama specifically downplayed a return to the Moon, and it seems he said that we won’t be doing that. I think that’s a huge mistake. Yes, we’ve been there before, but that was a totally different set of missions. That was a race to win, not to stay. A lot of science was planned and obtained for the Apollo missions, but it wasn’t sustainable. Stopping now — especially with a heavy-lift vehicle on the horizon — is a tremendous waste of an opportunity. Going to Mars depends critically on knowledge learned on going back to the Moon and staying there. So on this point I disagree with Obama’s new plan. Obama has clearly been listening to both supporters and critics (imagine that!). It almost sounds like he’s been reading my blog (I wish). Bill Nelson, a Democratic Senator from Florida, was vocally opposed to Obama’s initial plan, but accompanied him to this speech. That indicates to me that they have been talking — certainly about the politics, but also about the nuts and bolts — about all this. Obama’s change in plans to continue Orion and more concrete plans for a heavy-lift vehicle clearly come from listening to his critics. Certainly, this revamped policy the right political move for him; Congresscritters from NASA centers were pretty unhappy about that first policy of privatization. But it’s also the right thing to do. Obama, in this speech, stated specifically he wants us to be the dominant world power in space. He says that under this new plan, we will actually be sending more astronauts into space in the next decade than we otherwise would have. If his plans are accepted by Congress, if they are funded at the levels requested, and if NASA can implement them, then I think the President is correct. My overarching desire: that NASA have a clear goal, an actual set of specific, visionary destinations that will inspire the public and make us proud of our space program once again. Part of that desire is for this to have political support and funding to make it possible. Too often, NASA has been told to go do something but not given the money to do it, and that’s a major factor that we’re where we are right now. Obama’s new policy, with one exception, will give NASA what it needs to be visionary again. That one exception — not returning to the Moon — is a strong one for me, and I will see what I can do to get it put back in. I’m just one guy, but I’ll talk to folks and see what trouble I can stir up. In the meantime, I’ll also caution that at this moment, these are just words from the President. Good words, and hopeful ones, but just words. It will take deeds to see this through: a clear plan by the White House, cooperation from Congress, and a commitment from NASA to see this policy through. If those things can happen, then for NASA, for America, and for humanity, then the sky is no longer the limit.